I ran my first experiment in influencer marketing in middle school. My mom had bought me a pair of practical (her words) but hideous (my words) sneakers — and insisted I wear them to gym class. Believing — maybe rightfully — that my reputation hinged on having cool footwear, I convinced my mom to buy a second pair as a gift for my friend Kelly’s birthday. Kelly was the coolest girl in sixth grade. Everything she did turned into a trend. 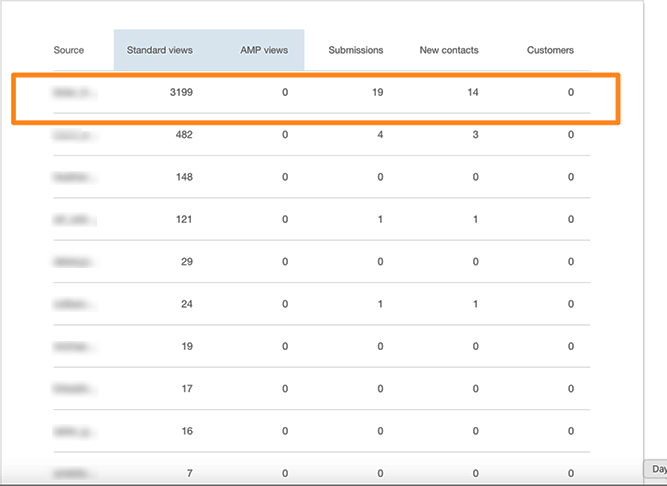 I didn’t think about influencer marketing again until I joined HubSpot. On the blog team, we’re always looking for ways to scale traffic — which gets continually harder as your audience grows. We’ve already captured much of the “low-hanging fruit.” Partnering with influencers could help us reach new readers while bringing our current ones fresh insights and promoting worthy thought leaders. Win-win-win. Turns out, those assumptions were mostly — even completely — false. Feature as many “heavy hitters” as possible. Feature the influencers’ products — giving them a clear incentive to promote the piece beyond being quoted as a thought leader. It’s not surprising this influencer is such a reliable source of traffic. He has more than 1.7 million Facebook fans. A mere 0.002% of them clicked on the link to the HubSpot Sales Blog. Is the solution to concentrate solely on massive influencers? Unfortunately, there aren’t enough out there in the sales space. I started handpicking influencers based on their network size and asking to publish their original content and/or repurpose some of their existing content — along with a social share, of course. This strategy requires much less time. Each post would receive fewer page views, but I’d be able to produce more in the same amount of time — meaning we’d drive more overall traffic. It’s also great for the influencers. They’ve already done the hard work of content creation; now they can sit back and enjoy its amplification. We send their posts out to our 50,000-plus email subscribers and give them the option of adding in-line links and a CTA to their website or virtual offers. 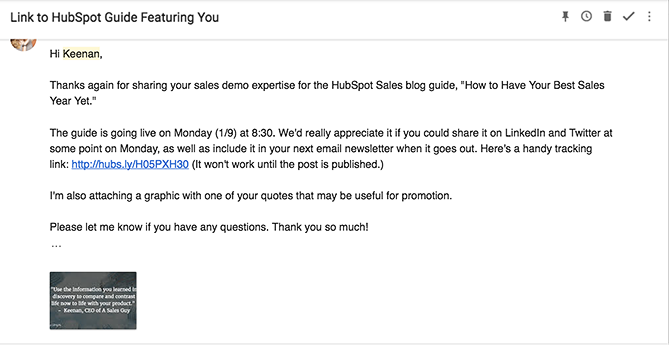 The post got 2,143 views — and 1,200 of those came from the HubSpot Sales Blog email subscribers. Because the author didn’t use the tracking URL I sent her, I can’t say definitively how many views her Facebook and LinkedIn posts generated, although it’s likely around 300. Not that impressive. We see similar results whenever we publish posts for “the name” versus the content. If the writing isn’t relevant, insightful, or helpful, it doesn’t seem to matter who’s got the byline — the post tends to strike out. A sales leader I found on LinkedIn is a perfect example. He’s not a recognizable name, but he’s built a solid following (almost 10,000 followers) by consistently posting entertaining, helpful articles on LinkedIn. His posts we’ve published get an average of 4,600 views. These partnerships might not create one massive traffic spike, but they’re lightweight for me to manage, generate content I’d be happy to share with our readers no matter who wrote it, and are a scalable way to work with influencers to produce content that consistently performs above average. My third assumption: Partnering with influencers is an efficient and scalable way to grow traffic — still true, if it’s the right influencer. 1) If you’re trying to drive traffic, use your time and energy to get one major influencer on board rather than five to 10 mid-level ones. I recommend looking at the influencer’s average Facebook post performance. If they’re receiving 600-1000+ reactions and 500+ shares on any given post, they’re probably a major influencer. Validate this by giving them a dedicated tracking URL to share and seeing how much traffic they drive. If the answers aren’t all “yes,” then I’ll ask the author to edit the piece. I’m proud of our readers. They’re not star-struck — if a post is great, they read it and share it, regardless of the byline. Ultimately, our best “hack” for growing traffic? Publishing great content. That’s an assumption I’m happy to operate under.